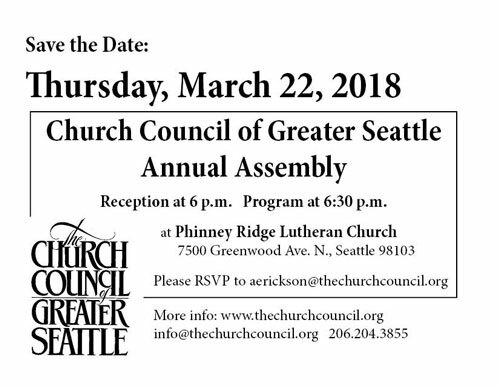 All are welcome and invited to attend the Church Council’s Annual Assembly on Thursday, March 22 with a reception at 6 p.m. and programming beginning at 6:30 p.m. at Phinney Ridge Lutheran Church, 7500 Greenwood Ave. N., Seattle 98103. Act faithfully and boldly to build bridges of relationship and solidarity in the face of brokenness and divisiveness. Your voice is critical so that our work and ministry might be extended and deepened for the building up of our communities. The Assembly is our major consultative event of the year. It is a time to gather with other members of the wider church and faith community, to hold sacred conversations, to learn what the Church Council is up to, and to inform our collective work. There will also be formal business, including reviewing the Church Council’s 2018 budget and affirming the Board of Directors and officers of the Board. We hope you can join us for this evening and leave inspired to: participate in the collective power of faith in action; connect with neighbor faith communities to mutually inspire and ignite one another; and catalyze and collaborate for peace, justice and the well-being of all. All are welcome. 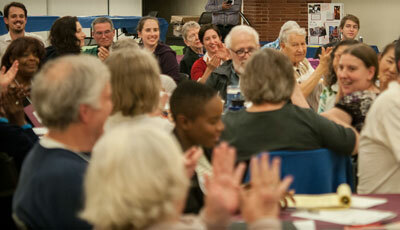 Please RSVP to Ann at 206.204.3855 by Friday, March 17.